eSource Optics standard VUV-UV Optical Filters are an open-faced designed filter which includes a substrate with an M-D-M (metal-Dielectric-Metal) optical filter thin-film coating on one surface. Open-faced VUV-UV filters must be handled with due care as the relatively soft M-D-M filter coating is exposed. Possible damage to the filter coating caused by handling, moisture or atmospheric contaminants can be reduced by covering and edge sealing the open-faced VUV-UV filter. 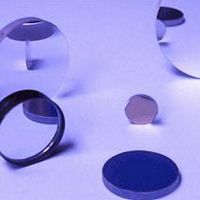 All VUV-UV Optical Filters from 170nm and longer UV wavelengths can be Covered & Edge Sealed for protective purposes. Covered & Edge Sealed VUV-UV M-D-M filters are protected by applying a machined spacer ring and a UV Fused Silica cover window onto the open-faced filter coated surface. The spacer ring is placed between the filter coated surface and the cover window, creating a small air gap between the coated filter substrate and the cover window. The edges of the two substrates are then sealed with a flat black optical edge sealing compound to hold the assembly together. Edge sealed filters can be handled without the risk of damaging the optical coating. 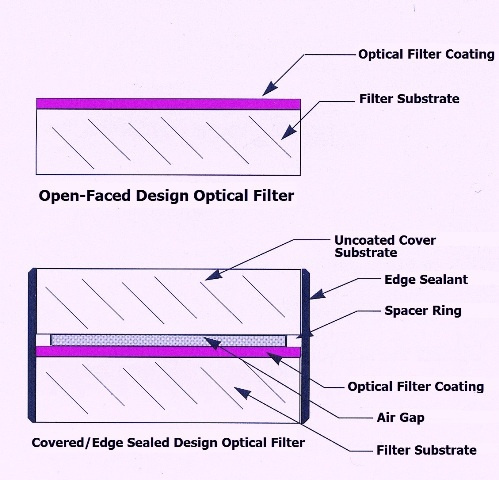 Optical edge sealing material increases the outside filter diameter by approximately ~0.012" and slightly decreases the filter effective clear aperture and peak transmission. For more information on VUV Optical Bandpass Filters, please refer to our VUV-UV Optical Filter Information Page . Contact us with any questions on VUV-UV Optical Filters, or to Request a Quote.